Not for all the tea in China would you get me to jump off a 216 m (706 ft) bridge into open space. 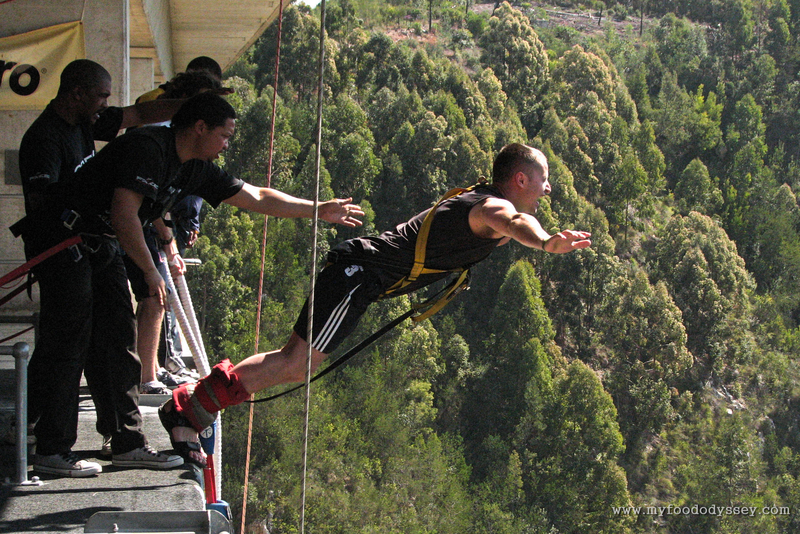 While researching our honeymoon in South Africa I discovered the world’s highest commercial bungy jump off Bloukrans Bridge on the famous garden route. From the moment I mentioned the jump to Arūnas insisted he was going to do it. We travelled a little out of our way to get there and when the bridge eventually came into view and Arūnas saw a person dangling in mid-air he froze with fear. I spent a good hour talking him into jumping as he’d probably never have the opportunity again. He finally took the plunge and reported that it was one of the most exhilarating things he’d ever done. The sensation of free-falling stayed with him for several days – he even jumped out of bed a few nights later while dreaming about it! He has since done a skydive and we both went white water rafting on the Zambezi, but I think this still ranks as his scariest self-expression. Oh, yee haw! Arunas. Brave man. Eight marines with loaded machines guns couldn’t get me off that bridge. I did the skydive bit back in the U.S. I would do the bungee thing. Looks like fun. Can’t believe he jumped out of bed! What a poor ending to a dream! 😦 But the real thing, that sounds spectacular! I think he actually enjoyed that dream! I think I remember reading on your blog that you were a gymnast so you’re probably far more flexible than I – I think my spine would snap in two if I jumped off a bridge with nothing but an elastic around my legs! Adrenaline I like, but with my two feet on the ground! Ooh, gliding sounds like fun! Was that here in Lithuania? 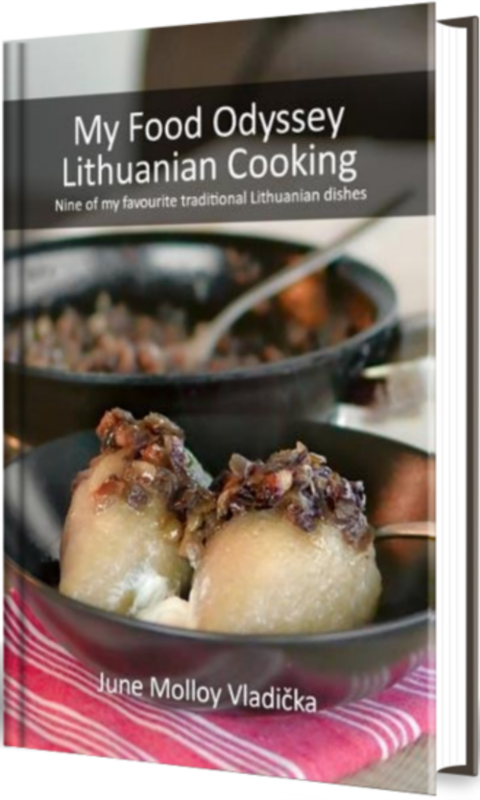 If it is I might mention it to Arūnas – I think he’s ready for his next adventure! No way. I can’t even go to the edge of a steep overlook, or even look down from the window of a tall building. I’m with you, Julie. I get panicky on a tall staircase! Aww, he looks so happy! I passed that on my way along the Garden Route, but just kept going 🙂 A sky-dive in NZ was adventure enough for me! You did a skydive?! Good on ye, as they’d say down unda. Nothing would pay me to do that, either! Nope. Not me. Not for all the tea in China, nor all the fake designer bags in Chinatown. 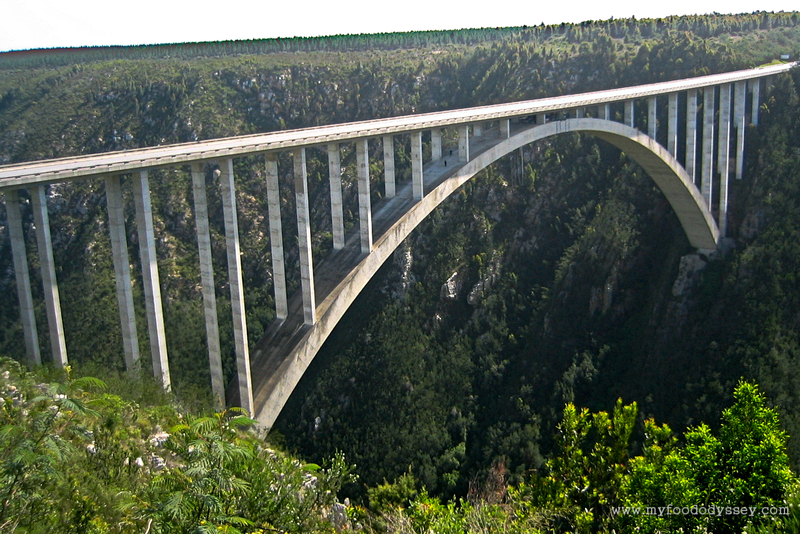 I too came across that bridge when travelling the garden route some years ago but unlike the brave Arunas I could not be persuaded to take the jump. Instead I observed from afar…probably from the same vantage point you had in photo No. 4!! I recall a girl was escorted all the way out under the bridge along a narrow beam to the launch point but then refused to jump. After 20 mins of coaxing she still refused and had to be escorted all the way back to the great annoyance of all the ‘jumpers’ queuing behind her (everyone had to back track to allow her to get back). 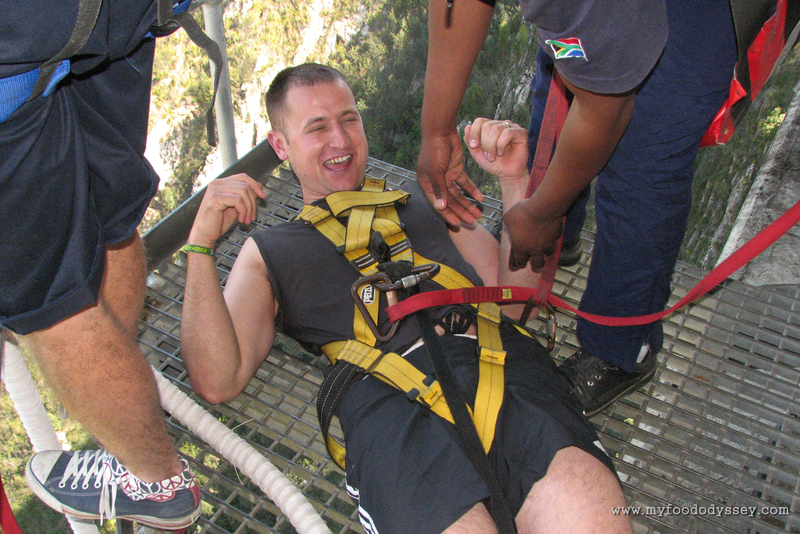 Frankly, I wouldn’t blame her…I witnessed a similar bungee/bridge jumping episode on the Gorge du Verdon in France some years previously and this guy skipped the queue, put the straps on his ankles and jumped…there was panic… they hadn’t assesses his weight. He went down, down and down…the rope began to tense but not soon enough. He splashed (smashed) into the river below, disappeared for several seconds (seemed like an eternity)… then sprang back out of the water like a Dingle Bay Dolphin…yelping with excitement like a Kerry Man on seven pints. Leave ‘em to it I say! That’s hilarious, Gary! Love the image of both the Dingle Bay Dolphin and the overexcited Kerryman!